The recent North American Leaders Summit in Mexico was seen as a perfect opportunity to try and kickstart the trilateral partnership. While there was no headline grabbers or major breakthroughs, the NAFTA partners still moved forward on some crucial issues that centered around North American competitiveness. They developed a shared set of priorities and established a roadmap for enhancing cooperation in areas such as trade, transportation, energy, as well as border facilitation. This includes creating a North American trusted traveler program which is part of ongoing efforts to establish a fully integrated continental security perimeter. During separate bilateral meetings, Canada and Mexico also took steps towards strengthening political, economic and security ties. On February 18, in advance of the North American Leaders Summit, Prime Minister Stephen Harper held discussions with Mexican President Enrique Pena Nieto. After their meeting, they signed a number of deals designed to further deepen bilateral relations. This includes two agreements which promote new trade opportunities between Canada and Mexico. They also announced a declaration of intent to expand defence cooperation, “which demonstrates a continued commitment by both countries to work together on security issues facing North America.” It is scheduled to be officially signed in April and, “will outline the manner in which enhanced bilateral cooperation will take place in areas such as military training, and defence research and materiel.” The two leaders also renewed the Canada-Mexico Joint Action Plan that provides a framework for engagement on important issues such as fostering competitive and sustainable economies, protecting our citizens, enhancing people-to-people contacts, as well as projecting our partnership globally and regionally. In the report Canada’s Trade With Mexico: Where we’ve been, where we’re going and why it matters, Laura Dawson, “examines the development of, and prospects for, the Canada-Mexico economic relationship and identifies key areas for future action.” The policy paper proposed increasing the number of state visits, parliamentary exchanges and trade missions between both countries. It recommended enhancing cooperation between Canada and Mexico in the energy and mining sectors. The report also encouraged all three NAFTA partners to improve progress in both regulatory and border facilitation programs and emphasized the need for closer collaboration on trade negotiations of mutual interest. Furthermore, it called on Canada to remove or reform the visa requirement for Mexican nationals which was imposed in 2009 in an effort to curb an increase of bogus asylum claims. The issue has been a source of tension between both countries. Before Prime Minister Harper’s trip to Mexico, business leaders urged him to lift the visa requirements for Mexican travellers. While the dispute wasn‘t resolved during his recent visit, Canada and Mexico signed an expanded air transport agreement which could serve as a precursor to eventually eliminating the visa restrictions. 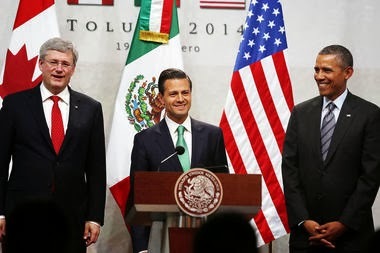 U.S. President Barack Obama, Canadian Prime Minister Stephen Harper and Mexican President Enrique Pena Nieto met in Toluca, Mexico on February 19, for the North American Leaders Summit. In a joint statement entitled 21st Century North America: Building the Most Competitive and Dynamic Region in the World, the leaders, “committed to developing a North American Competitiveness work plan, focused on investment, innovation and increased private sector engagement.” They also agreed to, “develop a North American Transportation Plan, beginning with a regional freight plan and building on existing initiatives.” In addition, the leaders pledged to, “streamline procedures and harmonize customs data requirements for traders and visitors.” This includes efforts to, “facilitate the movement of people through the establishment in 2014 of a North American Trusted Traveller Program.” The leaders also vowed to, “set new standards for global trade through the prompt conclusion of a high standard, ambitious, and comprehensive Trans-Pacific Partnership (TPP).” All three NAFTA partners, along with nine other countries are a part of the TPP trade deal which is currently being negotiated behind closed doors and is being pushed by big corporations. In conjunction with the trilateral leaders summit, President Obama signed an Executive Order on Streamlining the Export/Import Process for America’s Businesses. A move that the Guardian described as, “a gesture of defiance toward allies in Congress who are hampering his ability to negotiate controversial trade liberalisation agreements.” The article went on to say, “attempts to extend NAFTA to a broader Trans-Pacific Partnership (TPP) with Asian economies have divided Democrats in Washington who fear its impact on manufacturing jobs, leaving Obama without the authority of Congress to negotiate final details of the deal.” The Obama administration’s Fast Track trade agenda also suffered another blow when high-level TPP meetings in Singapore missed another deadline and failed to finalize an agreement. The growing domestic and international opposition to the secret trade talks have put the Globalists plan to use the TPP to upgrade and expand NAFTA to more countries in serious jeopardy. The recent leaders summit also represented an opportunity to begin work on formulating a coordinated North American energy strategy. New energy reforms passed in December of last year have opened up Mexico’s state-controlled energy sector and would allow foreign corporations to explore and extract oil and gas. This has the potential to lead to greater energy cooperation between Mexico, the U.S. and Canada. In the leaders joint statement, energy was identified as a trilateral priority. Later this year, the energy ministers from each country will meet, “to discuss opportunities to promote common strategies on energy efficiency, infrastructure, innovation, renewable energy, unconventional energy sources, energy trade, and responsible resource development.” With the region in the midst of an oil and gas boom, some believe that the next big step should be a NAFTA deal on energy which could transform North America into a regional energy superpower. In the coming years, energy integration will play an even bigger part in North American relations. Energy is already an important component of the U.S.-Canada relationship, but the long-delayed approval of the Keystone XL pipeline has caused some friction between both countries. The controversial project would carry oil from western Canada to the Texas gulf coast. While pushing for U.S. approval of the oil pipeline was one of Prime Minister Harper’s key objectives during meetings with President Obama at the gathering of the North American leaders, no new progress was made on the issue. Even before the summit, Harper maintained that if Obama doesn’t approve the pipeline, another president will. On January 31, the U.S. State Department released its final environmental impact assessment of the Keystone XL pipeline. A 90-day review period is now under way where different U.S. agencies will be able to comment on whether the proposed pipeline is in the national interest. It is unclear when President Obama will make his final decision, but efforts to block the project scored a recent victory when a law was struck down that allowed the pipeline to proceed through Nebraska. While proponents have argued that it would go a long way in advancing North American energy security and independence, critics have warned about environmental issues associated with the Keystone pipeline. Going into the North American Leaders Summit, there were various disputes between the NAFTA partners which threatened to derail the event. Nevertheless, the leaders managed to put on a united front. 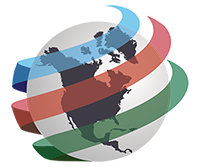 They committed to pushing a North American competitiveness agenda, along with other priority areas for action. In the end, any success at this year’s trilateral meeting will not be able to be properly measured until the next leaders summit which will be hosted by Prime Minister Harper in 2015. At that point, we will have a better indication on any progress that was made in implementing key deliverables that were announced and not to mention any subsequent initiatives that are also later launched. Although some of the buzz words have changed and the path towards achieving deeper integration has been altered, the goal for a North American Union remains the same.